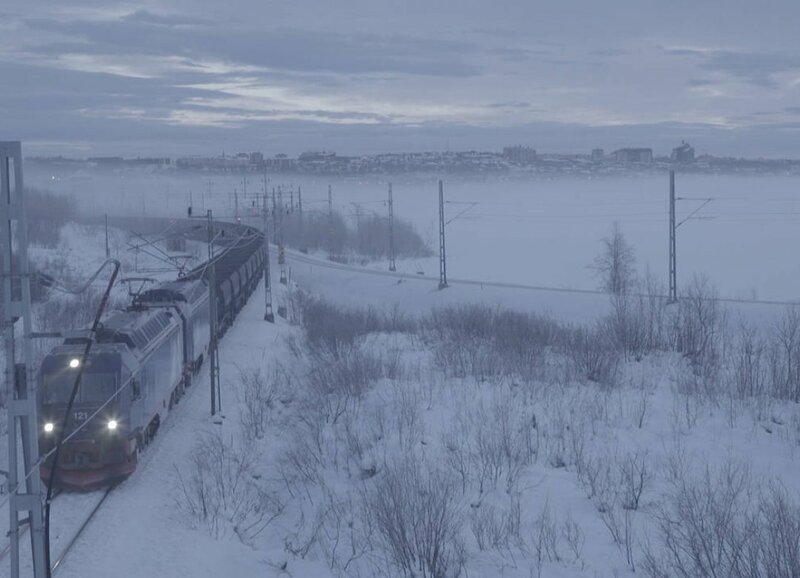 Greta Stocklassa is currently making Kiruna 2.0, a film about the relocation of a Swedish mining town. 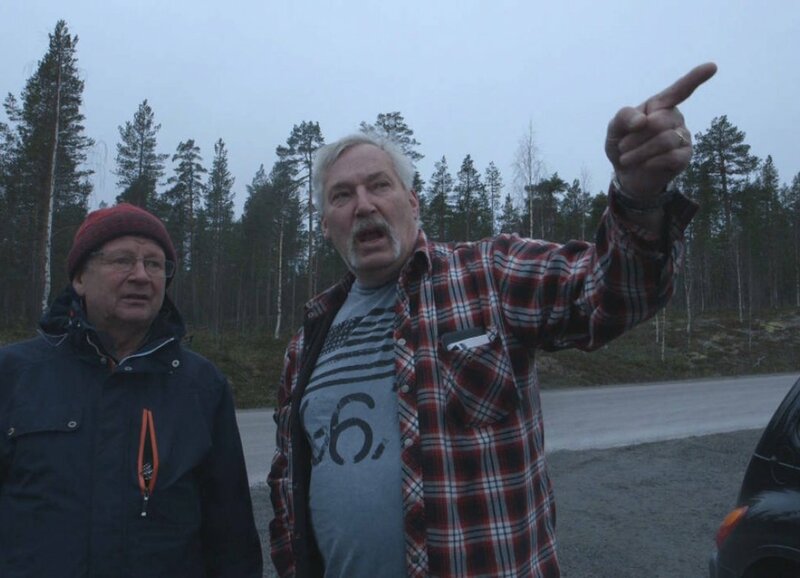 Being half-Swedish, Stocklassa is opening another opportunity for Czech documentary film to get closer to Europe, something more and more often attempted by young Czech filmmakers. The film will be presented at Czech Docs... Coming Soon during East Doc Platform 2019. The subject of town relocation sounds very catchy. 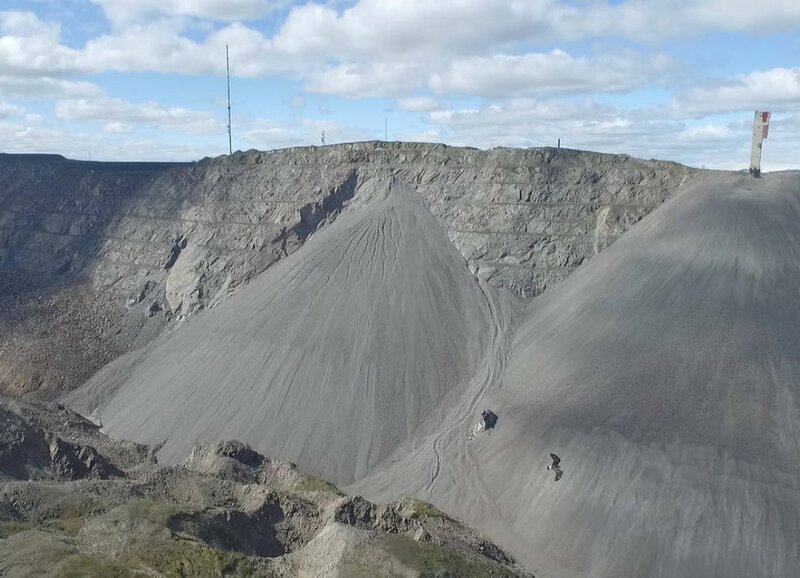 Kiruna is the northernmost mining town in Sweden. It was built a century ago because of iron ore that’s become the town’s major asset. Years later, though, they found out that the buildings had started sinking as the result of the mining activities. In order to resolve the situation, the authorities decided to retain the mines and to relocate the town. What would likely be viewed as a disaster anywhere else in the world, has been taken on by Sweden as a challenge. They have set out to build an ultramodern city, packed with state-of-the-art technology. Even if the future and the final shape of the city are still vague, their goal is to showcase Sweden’s progress in terms of technology, social and political issues. This story evokes Most in our context. Like in Most, the old town will be demolished, with the exception of a few buildings that will be moved, and the rest will be a new build. Like in Most, the authorities also want to boast the system’s ability to carry out a project this large. The difference being, of course, that in the case of Sweden, it isn’t such an ostentatious political propaganda. We tend to think that projects like this one are possible only in a harsh authoritarian regime. That’s what makes it so fascinating. Sweden has established itself as one of the most advanced democracies in the world and few people would ever guess that anything like this could happen here. Is it more of a procedural film or do you explore personal stories? At first, I was interested in the relocation itself but it soon turned out that to shoot the entire process would not be possible because it’s planned out over many years. We couldn’t hope that we’d be able to capture a significant part of the move during our shoot. Relocation has become a sort of metaphor used when we followed the stories of our protagonists. A metaphor for digging a hole under their feet, for exploring what the future might bring. 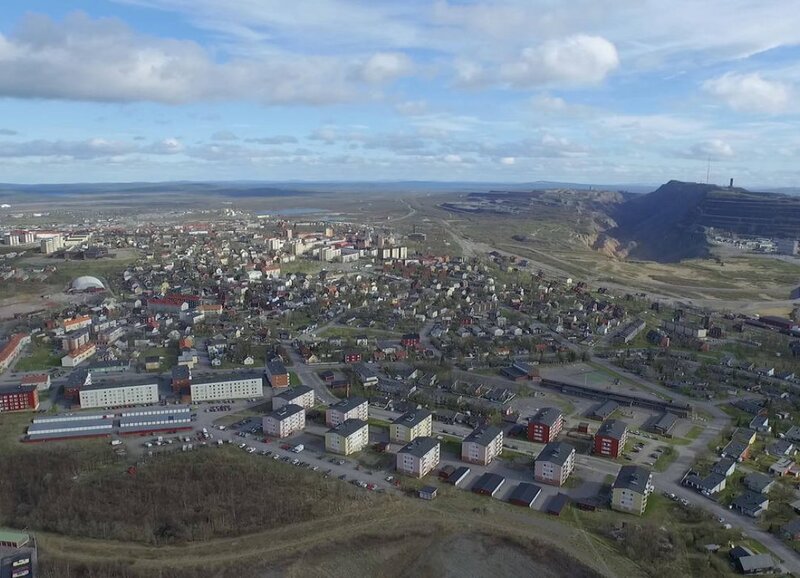 Kiruna is a town beyond the Arctic circle, at the end of the world, it’s a remote microcosm of Sweden. If the relocation is only a metaphor, to what degree and how far did you depart from it? We soon got pretty far away – and Kiruna’s move is only one of several motifs and symbols. In this uprooted place, we follow a Yemeni refugee and a girl who’s half-Sami – the Sami are a native people and often have tense relationships with Swedes. Our third protagonist, Timo, is the only one who’s actively involved in the relocation itself – he publicly opposes the move. All three are trying to find their identity in a place that’s gradually losing its own. Their stories intersect in a local school – Timo’s a teacher and the other two protagonists are students. Did you find out anything surprising? I’d expected there to be more protests but Timo was really one of the few people who voiced their negative view of the move. Others mostly just shrugged and accepted the decision as something they had to come to terms with. The locals don’t really feel sentimental about their town, unlike Czechs probably would. 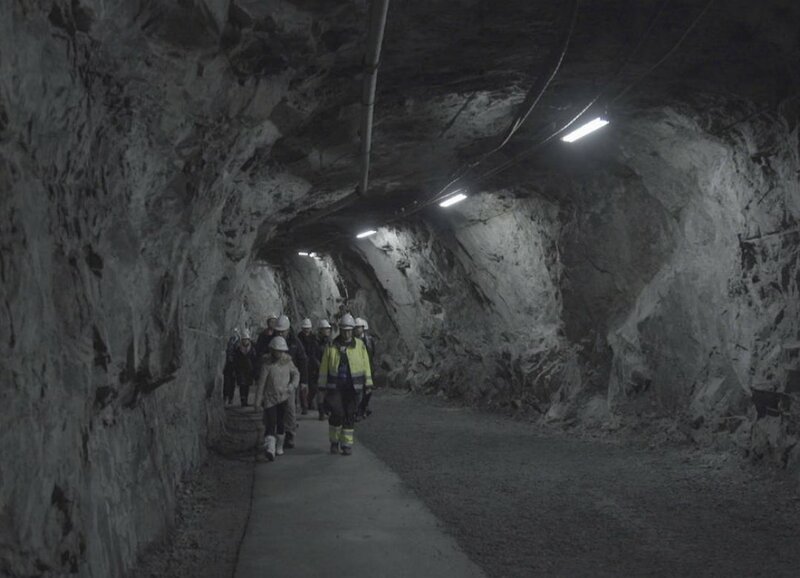 I soon understood that they feel as much connection to the mines as to the town itself, they accept it’s a symbiosis and they’re ready to sacrifice a lot for it. It speaks volumes about their values and priorities. Personally, I couldn’t quite come to terms with the general atmosphere but I adapted to it in the storytelling. I completed the initial research in 2014. In 2015, I spent two months living with a local family. I was there alone to get to know the place as much as possible. We started shooting in winter 2016. The initial footage was used for my B.A. thesis film at FAMU. We took roughly nine trips with the crew, each lasting around ten days. These intensive trips take a lot of precise planning and we often had to reenact situations we missed – e.g., Maja’s visit with her grandfather, a representative of the old generation. How often did you have to resort to stylization and staging? For the most part, we were reacting to events that really happened or were about to happen, and we adapted them. A few times we guided our protagonists to go somewhere they otherwise might not go because it could lead to an interesting meeting or a make a meaningful point. We created a cinematic shortcut for reality in this way. But first we consulted all of these scenes with them and explained their purpose. We’d never force them to be in situations that would make them uncomfortable or that would have a meaning that wasn’t clear to them. From what you said, do you take more of a “cinematic” rather than a “journalistic” approach to the film? It’s “cinematic” for sure. We use elements of film language that are common in fiction narrative. We use photogenic features of the environment and put a lot of care into the visual style. We shoot mostly using tripods, long scenes with long shots that capture the environment. In the audio track, we stay close to the protagonists using lav mics. We need to be convincing in capturing the local atmosphere because the viewers must understand it in order to understand our subjects and the community as a whole. This approach seems more common at FAMU today. In the past, style usually took a back seat within the more utilitarian approach. Released last year, Central Bus Station has the visual style of international rather than Czech films. It’s one of many current trends that’s been slowly making its way to FAMU as well. Everybody has a different view. Mr Vachek, for instance, sees my approach as something a bit suspect, vapid. On the other hand, Martin Mareček has been supportive. Their crucial concern is whether this story holds a sufficiently strong conflict. Do you see yourself following in the tradition of longitudinal observation as represented by Helena Třeštíková? Save for the multiple-year shoot, our approach has nothing in common with Helena Třeštíková’s work. It isn’t even a pure observation because that would require spending the entire time with the protagonists, which is not really possible when you shoot abroad. That’s why we had to work out something a little different and utilize other devices that, according to some, are not part of the observation style. I wouldn’t be able to work like Ms Třeštíková, mainly because she works on multiple projects at the same time. Over the past four years, I’ve been completely immersed in this whole project and it’s taken up all my brain power. Just like I’ve entered the lives of our protagonists, they’ve entered mine. How could I work on several films like that and really get below the surface? I can’t even imagine. This entire process has been pretty demanding mentally – I’ve established relationships with people who put their trust in me and I’ve felt obligated to give them all my energy. I think we’ll keep in touch even after the shoot. That actually makes you similar to Třeštíková. She also speaks about strong relationships with her protagonists. It’s a bit controversial. Documentary filmmakers have a primary obligation to the viewers and the medium, not to the subjects. You don’t agree? That’s really complicated. Firstly, obligation to the viewers and to the medium sounds rather abstract and one-sided – it can’t exist unless you first establish a relationship with the subjects along with all obligations arising from it. And for me, subjects are mainly real people who have a direct and profound relationship with me. I feel an obligation to the protagonists, viewers come second. Will you create active parallels to Most? No, that would make the film overly tied to Czech viewers and I don’t want to hamper it with unnecessary limitations. That applies to Sweden as well – it serves only as an case study of events that can happen anywhere else in Europe. It isn’t a film about a Swedish issue for Swedish viewers, or a Czech issue for Czech viewers. The film should be a universal and timeless reflection of contemporary Western society. A group of people are in a position to build a new 21st-century city from scratch. They can decide what it looks like, who lives there, how they live there and what issues they tackle. That’s a unique and burning question that goes beyond borders. Did you meet with people who are in charge of the relocation? I met with the chief urban planner but it isn’t my main focus. It wouldn’t be very interesting because the mining and construction companies are very cautious when it comes to the media. Even if they wanted to talk, we’d hardly get anything beyond a PR statement. Also, they aren’t eager to talk because these are state-run companies so that all of their budgets are secure – the less noise there is, the better. We’re now in the editing stage. We’ll start again in January and still have a lot of work left. We have roughly 80 hours, which is just right. We didn’t try to shoot as much footage as possible. We were trying to be reasonable so that each shot had some kind of purpose. Also, before we can work with the material, I have to subtitle it for my colleagues and editor because I’m the only Swedish speaker. How do you get along with your editor? I work with editor Hana Dvořáčková, my classmate at FAMU. I’d say we have a healthy working relationship. Sometimes we agree on stuff, other times we disagree and then we look for the best possible solution. Sometimes we take turns editing, for instance, I might prepare a rough edit and then we discuss the details. Does Hana Dvořáčková have any creative ambitions? Recently I asked several editors the same question for a piece I was writing, and it seems that they all see themselves as more than just technical professionals. I can’t speak for her but I think that she isn’t as radical as some of the other editors and she keeps a certain distance. But I don’t doubt that she really cared about the material and I can’t even imagine editing with anybody else. A personal, creative relationship with the material probably comes naturally even if you don’t try. Perhaps that’s how it should be because if an editor harbors a priori creative ambitions and fails to connect with the director, then you have two clashing visions battling it out in the editing room. The director gets something they didn’t want and then has to fight to make the editor redo it. It’s definitely important for the editor to be personally invested in the project but strong egos can create problems. That’s why I think that Hanka’s restraint is a good middle-of-the-road solution. I’ve learned a lot from our collaboration and some of her methods have helped me a lot. What about cinematography? You said that visual style was really important to you. Our cinematographer Standa Adam deserves the most credit for the film’s visual style and for making the film so much better for it. Our relationship was rather dynamic at first. When it was just me, sound designer Pavel Jan and Standa Adam going on shoot trips in Kiruna, Pavel was often the one who had to restore some kind of peace. Standa and I are both really stubborn and have big egos but some of our conflicts worked to help us find the best possible solution. Pavel, on the other hand, was a great help in approaching our protagonists. He’s able to make use of the fact that sound designers are really close to people during a shoot. They are also literally close to the protagonists when they attach their lav mics. That allowed him to have a close relationship with them. He was able to suggest how to proceed and what we could ask from them. Toward the end, our three-member crew finally had good chemistry and we’re good friends now. Do you have any ties to Sweden? Sweden has a reputation for being nearly perfect but it has a really high suicide rate. That’s a stereotype that is partly rooted in the cold weather and long periods without sunshine that people struggle with. But it’s largely a myth. And sure, there’s something to the dark underbelly of this seemingly perfect society. People who are used to a well-run system, lose some of their skills and instincts, like the ability to improvise, for instance. Swedes seem to live like according to a manual and any problems are conveniently swept under the rug. But what happens if the manual is wrong? Or if there is no manual for a given situation? I like exploring these issues and examine them in Kiruna as well. None of this would have probably crossed my mind if I’d stayed in Sweden. All of this started to come into focus once I had something to compare it to. And that bit of a critical distance makes me appreciate Sweden more. How is the film doing in terms of funding? At FAMU I received a modest contribution of fifty thousand koruna, which is, of course, insufficient for making the film. Later we received money from the Czech Film Fund – we’d applied for production support and, surprisingly, succeeded the first time. There’s no money from Sweden. We wanted to try applying but it turned out to be unfeasible. Although I have a Swedish passport and the story was Swedish, we were treated as a foreign project, which involves way too many conditions and regulations. When it comes to filmmaking, Swedes are very much focused on their local pond. We’ve had an offer but the amount was too low. If we’d tried to adjust the project to suit the requirements of their funding support, we’d have lost out and probably shut off some distribution channels that way. I’m not surprised you’ve secured support from the Fund. Its former chair Přemysl Martinek once told me they didn’t get enough international stories and that they got sick and tired of the same old local stories. Yes, we’ve received the entire application amount. Our application might have been too modest. Anyway, I definitely believe it would be a shame to work only within the Czech context and documentary filmmakers will benefit from looking for stories other than the local ones. The subject should be universal and it should speak to something more general – not just a random event that just happened somewhere. Sure, there’s nothing wrong with it if somebody focuses on local issues but I’m generally in favor of a greater openness to the outside world. I see more and more of my peers interested in non-local stories and our FAMU department is also increasingly more encouraging in this respect.